For courses in manufacturing processes at two- or four-year schools. This text also serves as a valuable reference text for professionals. 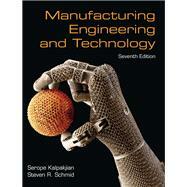 An up-to-date text that provides a solid background in manufacturing processes Manufacturing Engineering and Technology, 7/e ,presents a mostly qualitative description of the science, technology, and practice of manufacturing. This includes detailed descriptions of manufacturing processes and the manufacturing enterprise that will help introduce students to important concepts. With a total of 120 examples and case studies, up-to-date and comprehensive coverage of all topics, and superior two-color graphics, this text provides a solid background for manufacturing students and serves as a valuable reference text for professionals. Professor Serope Kalpakjian has been teaching at the Illinois Institute of Technology since 1963. After graduating from Robert College (with High Honors), Harvard University, and the Massachusetts Institute of Technology, he joined Cincinnati Milacron, Inc., where he was a research supervisor in charge of advanced metal-forming processes. He has published numerous papers and is the author of several articles in encyclopedias and handbooks; he has also edited various volumes and serves on the editorial boards of several journals and the Encyclopedia Americana. He is the author of three additional manufacturing books, two of which received the M. Eugene Merchant Manufacturing Textbook Award. He is a Life Fellow of the American Society of Mechanical Engineers, Fellow and Life Member of ASM International, and Fell of the Society of Manufacturing Engineers, and is a full member (Emeritus) of the International Institution for Production Engineering Research (CIRP). He is a founding member and a past president of the North American manufacturing Research Institution. Professor Kalpakjian has received several awards: Citation by the Forging Industry Educational and Research Foundation for best paper (1966); Citation by the Society of Carbide and Tool Engineers (1977); The "Excellence in Teaching Award" from the Illinois Institute of Technology (1970); the "Centennial Medallion" by the American Society of Mechanical Engineers (1980); the International "Education Award" by the Society of Manufacturing Engineers (1989); and the Albert Easton White Distinguished Teacher Award by the American Society for Metals International (2000). Dr. Steven R. Schmid is an Associate Professor in the Department of Aerospace and Mechanical Engineering at the University of Notre Dame, where he teaches and conducts research in manufacturing, machine design, and tribology. As the Director of the Manufacturing Tribology Laboratory at the university, he oversees industry and governmentally funded research on a wide variety of manufacturing topics, including tribological issues in rolling, forging and sheet metal forming, polymer processing, medical device design and manufacture, and nanomechanics. He received his Bachelor's degree in Mechanical Engineering from the Illinois Institute of Technology (with Honors) and Master's and Ph.D. degrees, both in Mechanical Engineering, from Northwestern University. Dr. Schmid is the recipient of a National Science Foundation CAREERS Award and an ALCOA Foundation Young Faculty Award. He has been a leading proponent for the integration of research and engineering education; NSF has sponsored workshops on this issue for which he has served as head of the steering committee. He is the author of over thirty technical papers in various journals, has edited three conference proceedings, has co-authored "Fundamentals of Machine Elements," and has contributed two chapters to the CRC "Handbook of Modern Tribology." He serves on the Tribology Division Executive Committee of the American Society of Mechanical Engineers, and has held officer positions in the Society of Manufacturing Engineers and the Society of Tribology and Lubrication Engineers. He is a registered Professional Engineer and a Certified Manufacturing Engineer.